The Garlando F-200 Evolution is the entry level of the Evolution line, the special series of three football tables which also includes G-500 Evolution and G-2000 Evolution. 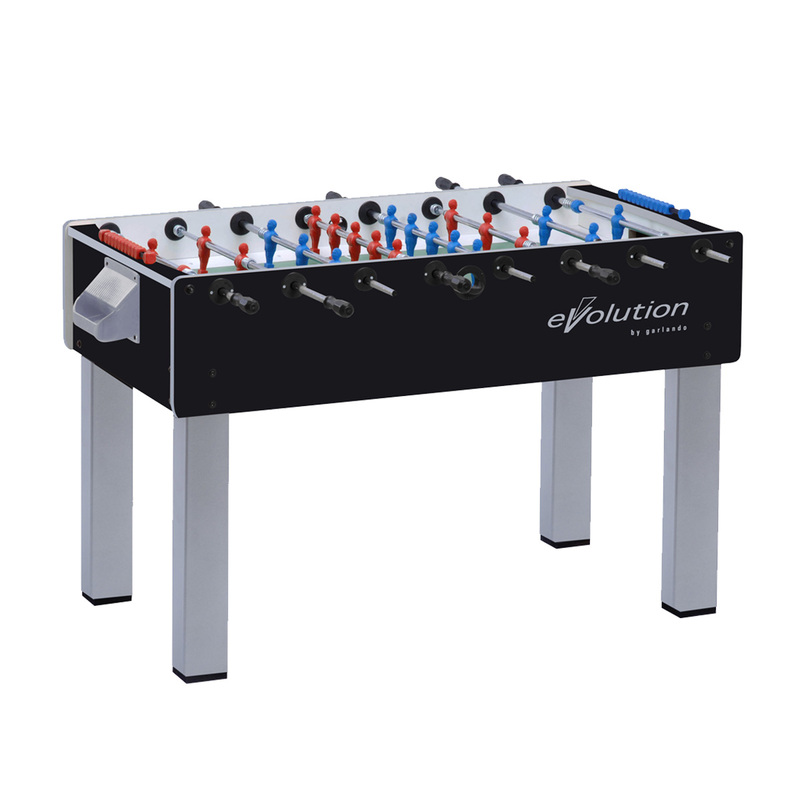 The Garlando F-200 Evolution is the entry level of the Evolution line, the special series of three football tables which also includes G-500 Evolution and G-2000 Evolution. The sturdy construction is greatly enhanced by the smart color combination inspired to the hi-tech style. The grey ball baskets on the black cabinet add a touch of elegance. The telescopic safety bars provide children with greater protection. The cabinet is constructed ¾ inch thick medium density fiberboard (MDF) with a melamine coating to help prevent scratching. 3.5 inch square MDF legs are coated with silver melamine. High stress resistance machine-trued hollow 16mm diameter steel bars are coated with anti-rust chromium-plating. The quality of the materials used adds to the thickness of 2mm to prevent the bars from bending, maintaining a perfect shape. Bars are fixed to the cabinet by means of nylon ball bearings. The steel roller bearings inside the bearings fixing bars to the cabinet greatly improve the game speed, while reducing the stress for the players’ wrists. Red and blue one-color players in plastic material (moplen) representing a stylized human figure, are directly molded onto the bars: they do not move, cannot be displaced and maintain their positions perfectly. Plastic laminate playfield with silk-screen printed white lines on a green background reproduces a soccer pitch (field). Balls are served through a filler on each table side. Easy and immediate ball retrieval through a basket behind each goal. Color coordinated abacus scorers and 10 white standard balls are included. Assembled dimensions: 57-3/32”L x 43-5/16”W (with bars) x 36-7/32″H; 132.25 pounds. F-200 Evolution complies with the harmonized European rules EN on safety.